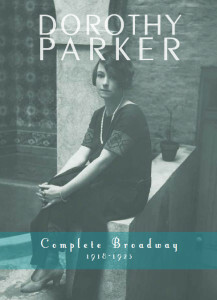 Since her death in 1967, nearly all of Dorothy Parker’s poetry and fiction have been collected into handsome volumes. Now, for the first time, all of her Broadway reviews from 1918-1923 have been located and presented to a new generation of readers. These pieces were Mrs. Parker’s bread and butter in the era of the Algonquin Round Table, the day job that paid the bills while she wrote light verse and short stories on the side. This book is the first collection of more than sixty of her drama columns.